Did you know September 25th was National Comic Book Day in the US? If not, that’s ok — check out our Holy Typography Batman! pinboard and find some comically set typography. Yesterday was International Talk Like a Pirate Day, so if yer still out revelin’, here’s some type booty for ye to check out. Our X Marks The Spot pinboard is a collection of typographic treasures and photos from fStop Images that’ll suit yer fancy. While Video Games Day is in July, National Video Games Day is actually September 12th. Did you celebrate yesterday by playing video games? If not, that’s ok — check out our collection of pixel fonts that will remind you of the days you had to blow into a cartridge to make a game work. Our Like A Boss board brings back 8-bit memories — finding the Triforce, fighting off the undead in Transylvania, realizing the Princess is in another castle. Maybe you can use Lomo Std or Sys Flash Ten and create your own video game. Today is Fight Procrastination Day (we’re not making this up! ), so grab a cup of coffee and do this: check out our Mugshot pinboard. Don’t think of it as procrastinating; you’ll be looking at type, which is definitely important! Ready for a new semester? Even if you’re not yet ready for all the homework and exams in store for you, our Back To School pinboard is a collection of images and fonts that are reminiscent of playgrounds, chalkboards, and learning how to connect your letters in writing with that thing called cursive that will help ease your mind. From fonts that remind you of elementary school like Lemonade Std Regular to fonts that hold memories of pep rallies and high school football games such as Yearbook Std Solid and Princetown Com. How many of you are excited to start a new school year? Ok, maybe you’re not excited for all the new books you have to read or all the lectures you have to sit through, but we have something that will keep you interested. Our Alphabetized board is a collection of interesting finds that showcase full alphabet designs ranging from posters, unique fonts, home decor, and character sets designed just for fun. As the end of summer is nearing, it’s still important to stay hydrated! August is National Water Quality Month in the US, so we went fishing in our ocean of fonts for some water-themed faces from Linotype’s WaterFlag Regular and F2F Whale Tree Std Regular to Electric Typographer’s Finfont — you can find these gems in our Water You Waiting For board. Did you enjoy our travel-themed newsletter this week? We have a few vacation boards on Pinterest from past trips our very own FontShoppers have taken. From Tokyo to London, check out non-Western type in use and find Old English in the UK. It’s a new month! If your brain begs for more inspiration over the weekend, find typographic projects and posts on our Ideas & Inspiration pinboard. Aside from this one board on Pinterest, we have almost 60 boards that may help get your creative juices flowing for your next or future projects including Found Type, Lettering, and Swashbucklers. If you liked our Cartographic Guide in your inbox on Wednesday, we have some typographic treasures mapped out for you in our X Marks The Spot pinboard. Navigate to fonts like Treasure Trove OT from Comicraft and Incognito Pro from Fountain that includes cartographic elements such as compass dingbats and glyphs of whole pieces of land. Pinterested: Water You Waiting For? It’s summertime, so remember to stay hydrated! Here at FontShop in the middle of camping season, we went fishing in our ocean of fonts for some water-themed faces from Linotype’s WaterFlag Regular and F2F Whale Tree Std Regular to Electric Typographer’s Finfont — you can find these gems in our Water You Waiting For board. Quench your thirst for typography with this Pinterest board and follow us for new boards. Staying out of the heat and feel like browsing fonts this weekend? Check out our Great American Faces pinboard, which highlights some awesome pictures from fStop Images and our Top 10 American Typefaces from our Independence Day Focus newsletter last year. Here at FontShop, we offer different ways for you to get your fonts. 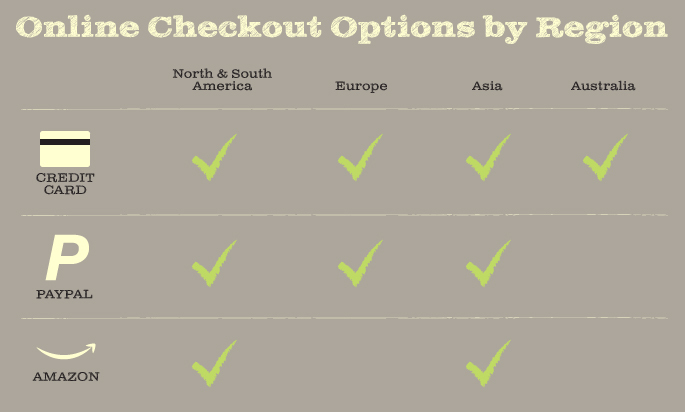 You can choose to checkout online (which we recommend!) or be invoiced and pay by check or wire transfer. Today, we’ll talk about the options you have when checking out online. The first step is making sure you have an account on FontShop.com. If not, create an account by registering with your email address and verify your email once you get the confirmation email that your account has been created. You will always have the option to pay by credit card no matter where you are; we accept Visa, MasterCard, American Express, and Discover. If you’re in North or South America, Europe, or Asia, we’re happy to let you know you also now have the option of PayPal! And finally, if you’re in North or South America or Asia, you can also choose to checkout via Amazon Payments. Do note that the font prices are only listed in three currencies based on your region: US Dollars, Euros or Australian Dollars. At this time, we do not list prices in pounds or yen. We generally recommend trying to check out online since it’s usually the quickest way to get your fonts (especially if you’re in a rush to get that project done before the deadline). Once you’ve completed your purchase, you’ll be able to download your fonts to your computer immediately! If you need help checking out, first take a look at our post “Buyer’s Guide: Having Trouble Checking Out?” If you do need to invoiced and pay by check or wire transfer, however, please contact our Sales & Support Team and we’ll get you set up and get you the fonts you need. Wedding Month Design Contest: Don’t forget to Like your favorite design before July 1st! I do, I do, I do: Find beautiful photographs from fStop Images and great examples of typography in wedding design. Love At First Type: Some typefaces that will warm your heart. Great Pairs: Here, you’ll find pairs of all kinds (not just script faces), some of which you might find could be a great pair for your wedding invitation! Lovin’ U: A random collection of fonts — browse some faces that will make U look good! Don’t forget to follow us on Pinterest for font updates! Don’t forget to check out the submissions for our Wedding Design Contest on Pinterest. Our Wedding Month Design Contest pinboard features over 80 designs that were submitted — simply Like your favorite pinned design on Pinterest before midnight on July 1!